Freedom of panorama is the liberty of taking a photo/video of any object permanently placed in the public space, and being allowed to publish it. This possibility is a country specific copyright adjustment that has been implemented in many countries, but not everywhere. 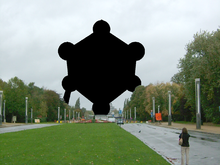 Read about Freedom of Panorama in the article on Wikipedia in English, Dutch, French or German. 15 July 2016 - 1737 previously deleted files because of missing freedom of panorama are restored on Wikimedia Commons. An overview of the restored files can be found at this page at Commons. Today, photos of the European Parliament are not allowed to be on Wikipedia. This page was last edited on 6 March 2018, at 12:51.